Fast forward to April/May of this year. A lot of stuff happened in between, and we’ll get to that in later posts, but for now, we are working on the kitchen. As in taking out walls–that’s a later post too–but for the past few weekends, I’ve been sanding. 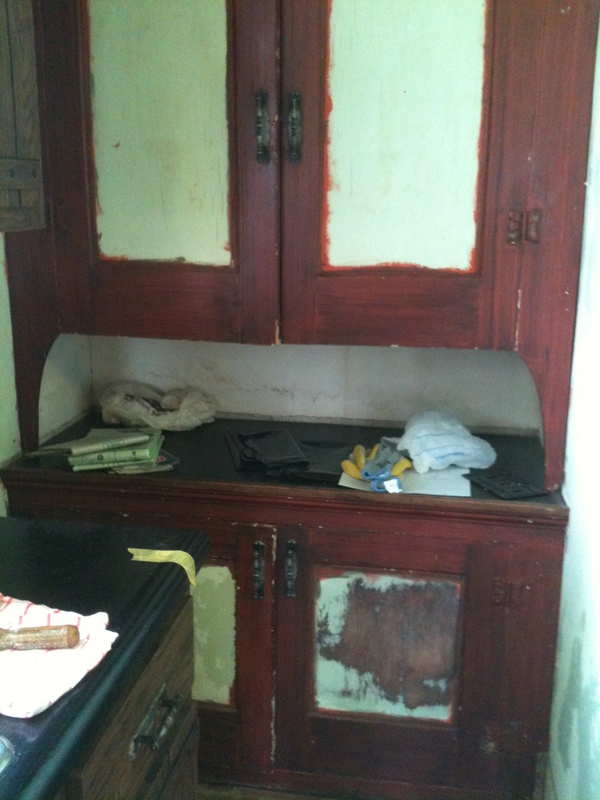 Not just smoothing rough edges, but taking off 4 coats of paint and the original varnish of kitchen cabinets. Oh did we dither about kitchen cabinets! They are so expensive, and I want white. The white cabinets that one can purchase at the BB stores are not wood; laminate, thermofoil, melamine, lacquer, acrylic–they have all sorts of fancy names and initials for what is really just junkboard. I’m a purist; I like real; I like old; I like authentic. So I wanted wood cabinets. The unfinished cabinets at Home Depot and Lowe’s were oak. 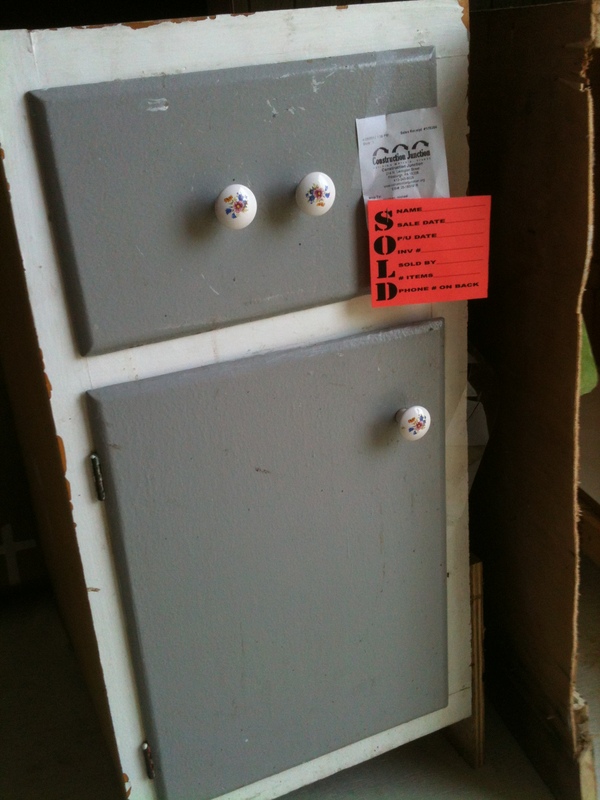 It seemed a shame to buy oak cabinets and paint them white… So we haunted the Habitat for Humanity Restores in Washington and Edgewood and Construction Junction in Point Breeze. It took several visits in all places–and we found some other cool stuff in the meantime–but one day we came upon Really Ugly Cabinets. They were so ugly, we almost passed them right by. But when we stopped and figured it out, they were almost a perfect fit for the sizes of cabinets that we needed. Straight out of the early fifties–made from sandable birch plywood all through. They weren’t quite the doors I wanted, but for $225 they will work. Since we saved so much money on cabinets, the plan now is to buy really expensive countertops! So now I am the sanding queen. You know the song. Unfortunately the only words I know are the sanding queen, da da da da da, she’s the sanding queen, da da da da da da the sanding queen. I didn’t even know it was an Abba song until I saw Mamma Mia! with Meryl Streep. But in my defense, it probably came out in the late seventies, early eighties when I was busy with babies. I made the mistake of putting stripper on the first one. Oh, it worked okay, but it was very messy. Turns out, the coats of paint were put on right over the varnish, (NO PRIMER!) and they just peel right off with a scraper, which is much easier!!! 4 different colors–grey, red, lavender, green, and then the varnish. Any takers for those porcelain eyeballs? We set up my cabinet shop on the side of the back porch until this past weekend when the temperatures soared into the nineties. I moved into the air conditioned comfort of the living room and Michael hooked up the sanders to a vac. It’s a complicated system of hoses and extension cords and duct tape. He’s done it for me twice now, and the last time I was supposed to be paying attention so I could do it myself next time. I think I’ve got it. 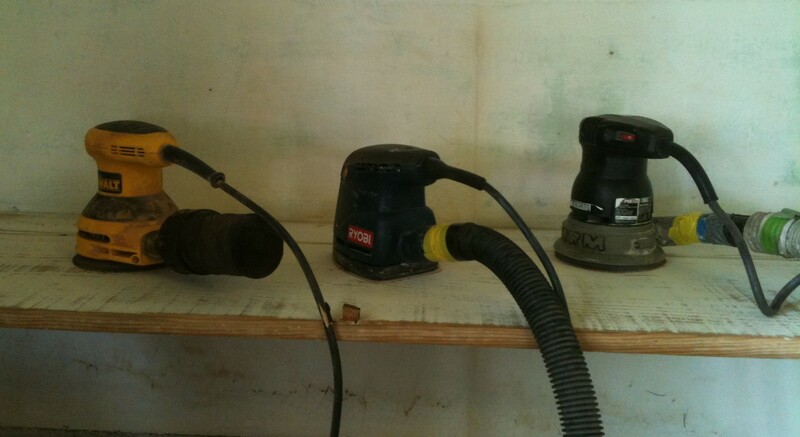 The biggest problem is that the two main sanders I use have different sizes of exhaust holes and I have to figure out which one goes where with what vacuum hose and they all get entangled with the extension cords. But Michael was the original Mr. Tool Guy–and he can always rescue me. The best part about the vacuum is that I can take off my breather mask! 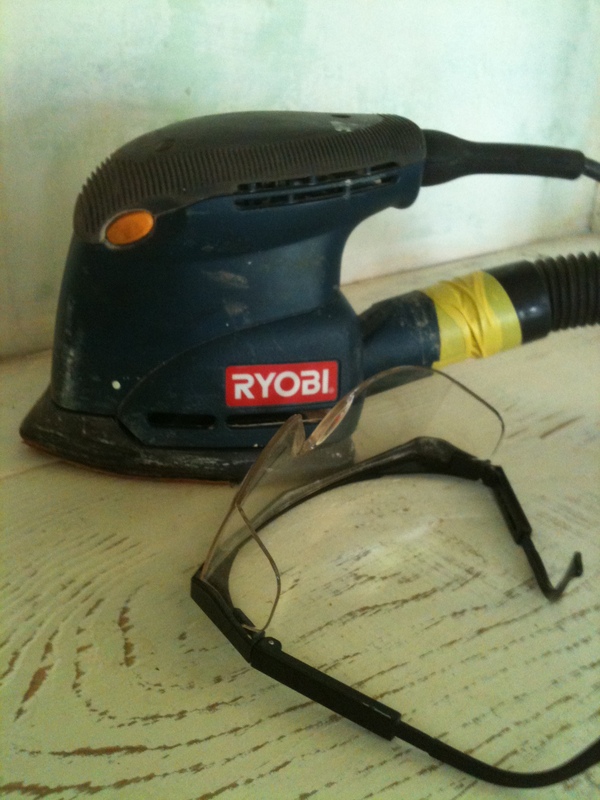 Always wear your safety glasses (AWYSG). 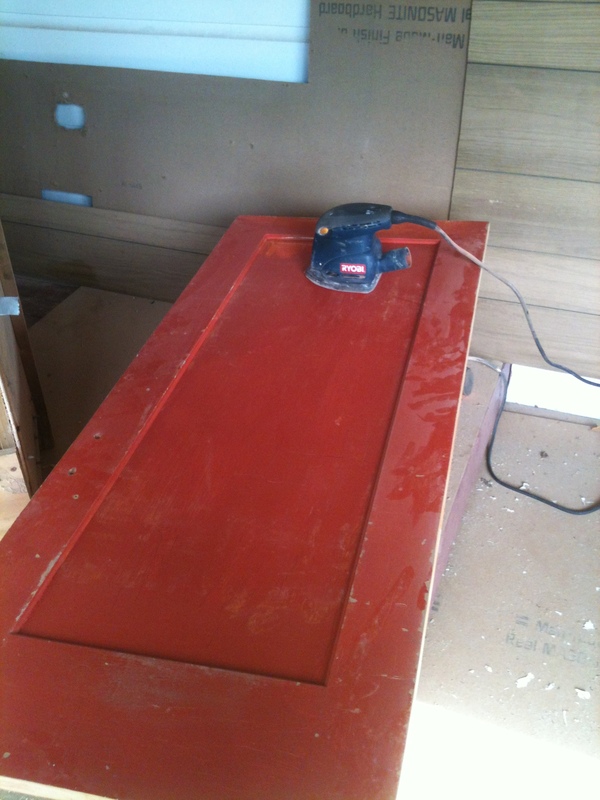 Just for variety, I’m also sanding the four doors to the built-in kitchen cupboard in the corner. These doors have antiquing from the seventies, bright orange paint, and then two layers of green. On both sides! Here’s a better picture–you can really appreciate the color. Michael must have been jealous of all the fun I was having sanding, because he got into the act also. 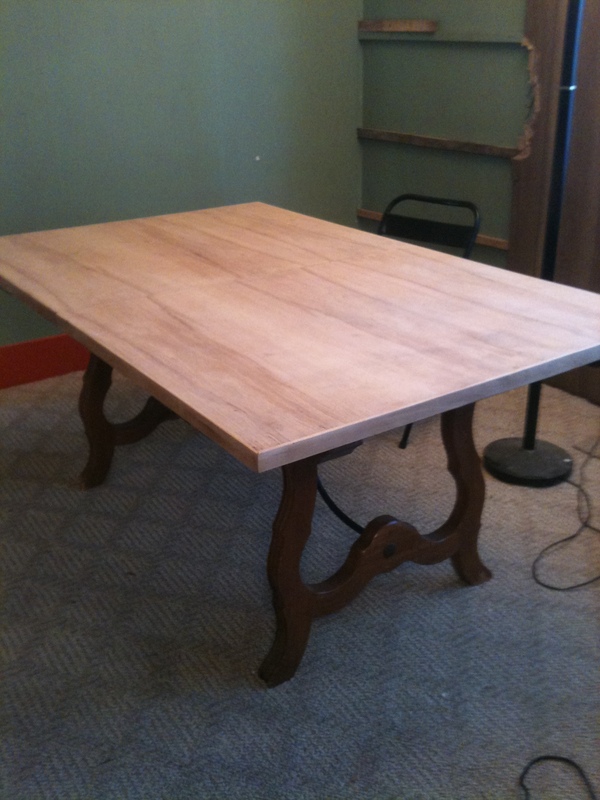 Last fall we bought a big table at the Restore for $35.00 — a great deal. It’s been sitting in the living room with a table cloth over it (protecting the beautiful finish!) 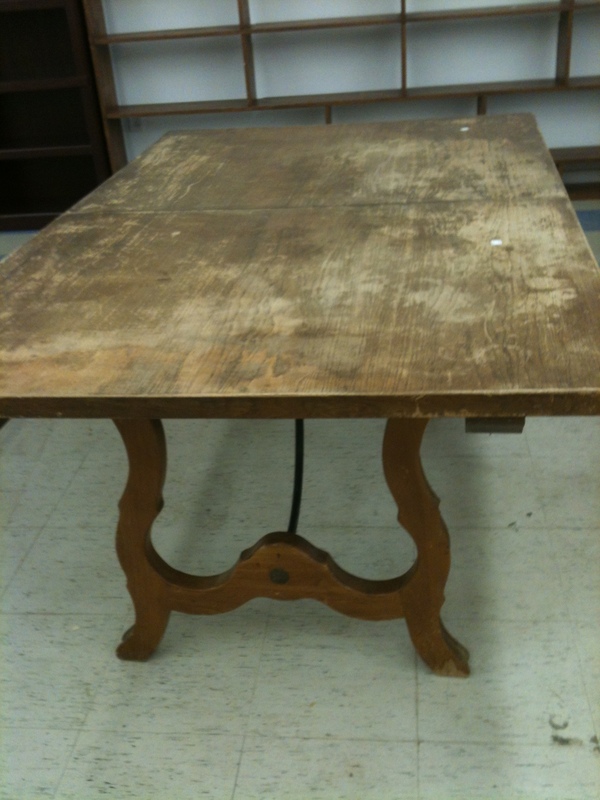 I was planning on staining or painting the top dark, dark green and calling it an old reclaimed table. But just see what Michael the carpenter can do–(even without a finish sander). Now my old reclaimed table idea has to be rethunk! I’m not sure what to do with it now. Michael likes natural finishes, but I sort of wanted it to be dark. I went to look at all the stains, but just couldn’t decide yet. That’s for another day when inspiration hits. Sanding is boring. The arm gets tired. The sander is loud. The vacuum is louder. The back starts to hurt. The mind wanders. There’s plenty of time for thinking, for praying, for counting blessings, for wondering, for comparing sanding to real life. Cleaning off layers of grime, old paint, and junk to expose the beautiful wood beneath. That’s what trying to live a holy life is like, isn’t it? Always we’re scraping off the gunk that the world leaves on us. Some of it’s been there for years–applied incorrectly, but still it sticks until we really try to scrape it off. And, oh boy, is it hard to get out of the corners! I’m thinking of the book I read last year called Somewhere More Holy by Tony Woodlief. It is some of the most beautiful writing I’ve ever read; he talks about home being where the sacred and the mundane meet when we search for God in the small everyday things–like sanding, like cleaning, like taking something ugly and reclaiming it. Next weekend I’m going to be sanding again. And the week after. And the week after. I’m sure I’ll tire of it. I just have to keep remembering what the finished product will be. Beautiful. Free of gunk. As good as I can make it. And I’ll post some pictures. I have serious table envy. But not sanding envy. Ugh.